Remember those bright-eyed moppets dressed like extras in Bette Midler’s underrated film For The Boys who sang a song about freedom and liberty under a Trump presidency in Pensacola this January? They’re suing Donald Trump’s campaign, claiming the moldy pumpkin with hair like candy floss stiffed them on pay and broke a contract. There was no merchandise table, and it wouldn’t have mattered if there was one: Security didn’t allow the girls to bring any of their merchandise into the Pensacola Bay Center. They left it outside in the parking lot, where all of it—the T-shirts, the CDs, the patriotic posters—was stolen while the girls performed their act, Popick says. 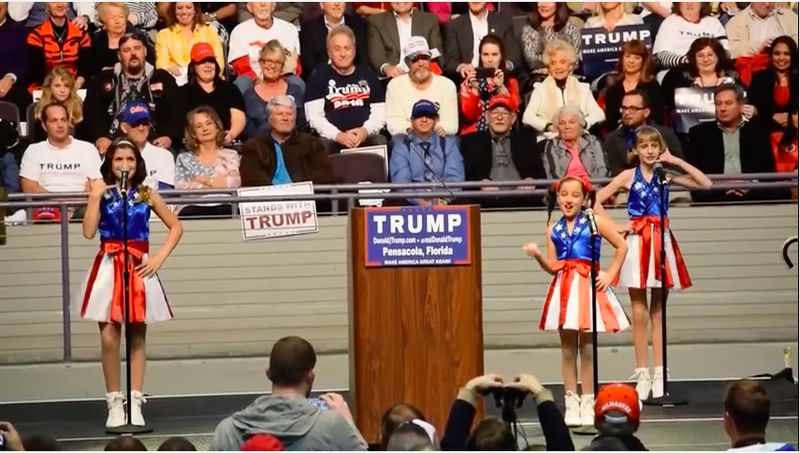 After the Freedom Kids’ inevitable viral fame, the Trump campaign asked them to perform at a rally in Iowa, for free, once again. The troupe’s request for a stipend to cover the travel from their home state of Florida to Iowa was denied by the Trump campaign, but Popick did what anyone would do, I suppose, and got those kids on a plane. Upon arrival, the kids were informed that their services wouldn’t be needed after all and were allowed to sit and watch the rally under the condition that they said nothing about this entire debacle to the press. I imagine most of America is starting to feel the same.